XBKE Portable Pump is the perfect partner for you if you love life, sports and cycling. It prevents flat tires and air leaks. CNC 6063 aluminum alloy, aeronautical quality brings the lightweight, tough, durable and fashionable pump. Identify the type of tire valve and use the corresponding Presta or Schrader valve on the pump; you can exchange Presta and Schrader by opening screw, and then fit the presta valve with the tire nozzle..The pressure is as high as 130 psi. With the cylinder structure,pump looks simple but magnificent. Aluminum alloy handle brings a perfect touch.The surface is treated by anticathode oxidation. Every detail is attended! No need to change the valve, automatically compatible with both Prestar and Schrader. With inflation needle or nozzle, most bike tires, inflatable balls, life buoys, kids' bikes and balls can be inflated. We persue for perfection with every aluminum alloy component. Never fades, abrasion durable, no color lost and long lasting. While guaranteeing the inflating effect, the pump's structure is reasonably designed with secure frame mount bracket. It is portable, weighing only 0.3lb, very convenient for both daily use and cycling. If you have any complaints on the product, we promise a full refund within 30 days. TOUGH AND DURABLE: With aeronautical quality aluminum alloy, It is lightweight, tough, durable, lasting and fashionable. LIGHTWEIGHT: While guaranteeing the inflating effect, The pump's structure is reasonably designed with secure frame mount bracket. It is portable, weighing only 0.3lb, very convenient for both daily use and cycling. EXTERNAL FLEXBLE HOSE:Easy to put air into the aluminum alloy body, The bicycle pump piston is strong with high pressure up to 9bar/130psi. Secure thread-on valve connection enables a tight seal with no air leaks. PRESTA AND SCHRADER COMPATIBLE: Identify the type of tire valve and use the corresponding Presta or Schrader valve on the pump; you can exchange Presta and Schrader by opening screw. 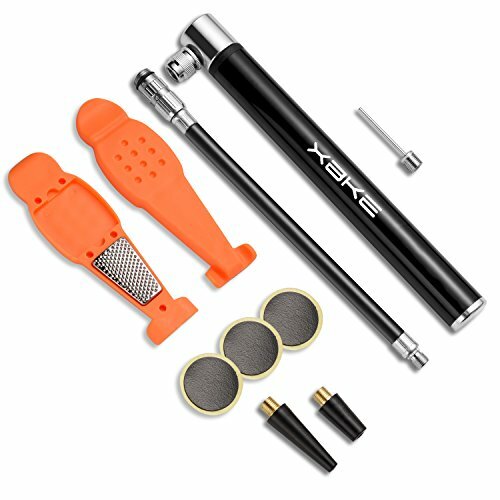 QUICK REPAIR OF TIRE:Repair kit including bicycle tire repair set, puncture kit, It can be prepared for a flat tire anywhere, essential tool for emergency. If you have any questions about this product by XBKE, contact us by completing and submitting the form below. If you are looking for a specif part number, please include it with your message.